Clever sisters, Nicola and Julia of GingerPye make a product that parents and children alike will love - not only are their lunch wraps incredibly practical, the amazing range of fabric colours and patterns ensure everyone's taste is covered. Ginger Pye is a small business started up by “mumpreneur” sisters Nicola and Julia. Stay-at-home mums with 4 children between us, we live in the great south of New Zealand (sunny Dunedin, that is). Nicola’s creative flair was the catalyst to start the business — after a number of people enquired where her fabulous homemade sandwich wraps hailed from, we decided to offer them to the public. We put our heads together, and are now producing a range of wraps to suit every taste, combining haute couture with environmental friendliness! 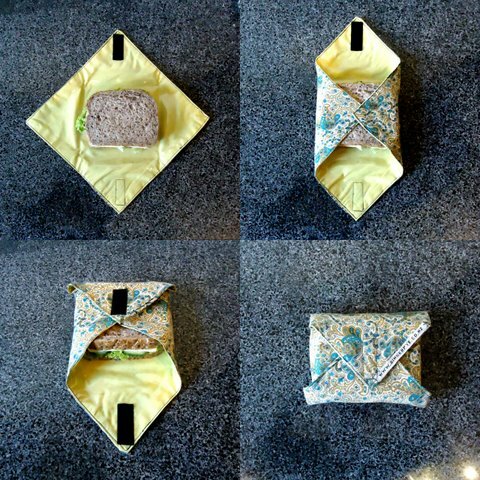 We love to make things that have an environmentally friendly quality, reusable or made from recycled materials – currently sandwich wraps are where it’s at for us! Nicola: a continually growing pile of books that I can never catch up on! Julia: started out as a tidy adult’s bedside table with phone, lamp and book, but has gradually been overcome by picture books, tissues, booties and other kids paraphernalia!! A small business management course would be super useful at this stage. Or a learning to crochet course for a bit of fun. And what about a Michael Jackson comeback concert anyone…? We created some great new bright pink fabrics recently when washing a batch of new (pale) fabrics and mistakenly including a non-colourfast bright red! Luckily the patterns were very forgiving and some ended up better than before! Dining room table and the desk in the lounge. 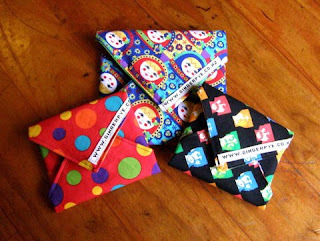 You can see Ginger Pye's full range at their website here, visit their Felt shop here, and learn about their happenings at their blog here.